Here are this week's updates and prayer topics. Please pray for Israel and the world! who can control them and give peace to the nations? Praise Jesus who is the hope of the ends of the earth, who calms down the turmoil of the nations, who forgives all our sins and who gives peace with God and peace with men (Ps 65:5,7, 2). May this good news of Jesus be proclaimed through the World wide Christmas worship services and messages! Glory to God, Peace to men!! - While the nations rise and wane, the kingdom of God extends day by day till our Lord's second coming without hindrance! -Praise and thank God that the Lord God has sent 45 new missionaries from our UBF thus far this year. While Venezuela has been unendurably suffering politically, socially and economically, God's work is ever growing. God has sent Jose Anibal following Juan Carlos' HC to Argentina a while ago. Please pray for him to receive a necessary visa to have a self supporting missionary life in Quito. May God send his coworker Yessika and daughter Estefania as soon as possible too. May God use Venezuela as God used first century's Jewish Diaspora who were scattered by persecutions to spread the gospel to other Latin nations and to all the world. God blessed Freiburg Campus ministry during last 22 years using us as shepherds and Bible teachers for German students. Most of all God sent M. General David and Rebekka Yaroslava Song as coworkers ten years ago. On 11/26 (Sat) at 11 a.m. God blessed our leadership succession ceremony from M. Noah to M. General David Song that will begin from 2017. Walter Nett (EU coordinator) gave an encouraging message from (Joshua 1.7-9) and blessed the new Director of Freiberg with Dr. Abraham K Lee, Caleb Hong and Dr. Mark Yang (Chicago HQ). We are now having an Autumn Bible conference. God sent Katalina Rebecca from Romania. S. Maria gave the opening message with the title, "Come to me you who are weary and heavy loaded." Isidora delivered a message, "Jesus, the eternal spring water." Tonight on 26, Lydia, Paul, Pauline, Isidora and Hara will have a purity vow ceremony. On 27 Stamatis gives, "The faith of Joseph" (Gen 39). Please pray for us to divorce this wicked and adulterous world and united with Jesus as his pure brides. Greetings in Jesus! Here we had snow one week ago. It became very cold. (-30c) We will have a winter Leader Conference (12/16-18). Please pray for the messengers of 1 Pet 2:1-9, John 3:1-16, Acts 9 and John 21. Please pray for my self supporting business that begins too. Please pray for us to have a nice meeting place. Pray for all to write a deep Life testimonies. We all may experience the power of Jesus' death for our sins and his resurrection to give us eternal life. M. Paul Jang went to Slovakia in 2007 and learned Slovak by faith. Then Korean Embassy was opened newly. He was hired because he was the one who spoke Slovak when the Embassy required it among Koreans there. M. Esther joined next year. S. Lukas was not a Christian when he went there in 2007 but just to open a business. He met M. Esther who was a regular customer of his shop and became a Christian in 2013 through Bible study with M. Paul. M. Grace Choi was a missionary to Egypt, as a Korean language teacher. When she finished her teaching, by God's leading she came to Slovakia in 2014 and established a HC with S. Lukas in 2015. When I went to their SWS, there was Olena from Kiev too. 1. Pioneering of Comenius University. M. Esther enrolled as a student in Korean studies to be near students. Since she already knows the material, she has been a blessing to many other students. 2. God may give M. Paul strength and wisdom to handle heavy embassy work. - This year Christmas offering will be used for India center purchase. May God bless Christmas Worship Services(CWS) around the world. International Executive Board(IEB) has decided to use CWS offering to help India UBF purchase a new Bible house, as they celebrate 30 years of ministry in India. The current place they are renting is structurally unsound. They are praying for a new place, and that is why IEB prayerfully decided to help them financially with this task. Dr. James and Kyung-hee Surh's prayer for the Westcoast,U.S. From Nov.9-12 James Surh MD and his wife Kyung-hee Surh MD paid a visit to Redding. 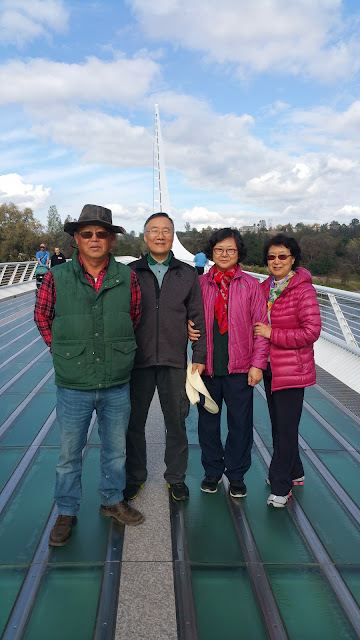 They kindly visited Peace Camp and prayed for the pioneering of the Westcoast U.S.
After the visit, they flew to Seattle to pray for the coworkers in Seattle area and Vancouver, Canada.